Who knew that small-town tweeting could get so complicated? 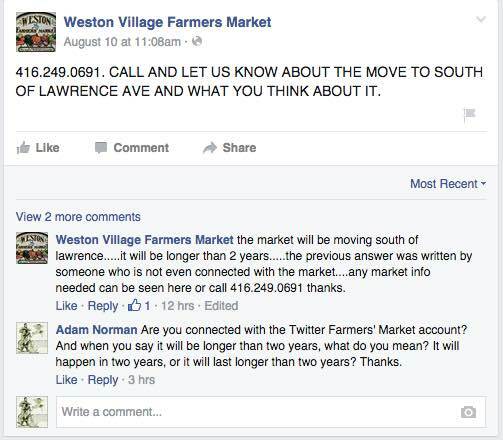 An as-yet-unknown person behind the Twitter account called Weston Farmers Mrkt announced last week that the market would be moving to the new GO Station lot. This announcement generated many comments, both in favour and opposed, when I wrote about it here. Fair enough, I guess. I’m not a trademark lawyer, and the BIA might take a very dim view of them using the name of the market, but the Twitterer is posting information about the vendors and wares, not slandering anyone. I had thought that she was more officially empowered, and I do wish she or he would tell me her name, but on the internet, nobody knows you’re a dog. But, and it’s a big but, the BIA contradicts the Twitterer. Marion O’Sullivan from the BIA says in no uncertain terms that the market will return to the John Street site when construction is finished. There you go. She was as clear as can be. As an aside, O’Sullivan also told me the Facebook account of the Market is also not authored by the BIA. This is strange, since some of the posts there are signed with her initials, MOS, and they give the BIA’s number. Doubly oddly, one post says that a “previous answer was written by someone who is not even connected with the market”, which implies that someone connected with the market is posting. Honestly, I have no idea what’s going on. I recently asked unambiguously both the Twitterer and the Facebooker who they are. The Twitterer declined to give it. I haven’t yet heard back from the Facebooker. I know the BIA, my screw ups, and the market can engender strong feelings. Please, if you comment, keep it civil. I love you all. We are family. WOW what a mess the Weston BIA is in. Does any actual group in Weston work effectively and as a voice for the community or businesses? Nope. NO Adam, being civil has done nothing for Weston. Being civil is getting us a 30 storey tower no one wants (except the BIA and Resident Group). And to further this thread, the Weston B.I.A. has no real power anyway. You have official word from the current coordinator? What does that mean? There have been at least eight coordinators sitting in that chair in about four years. 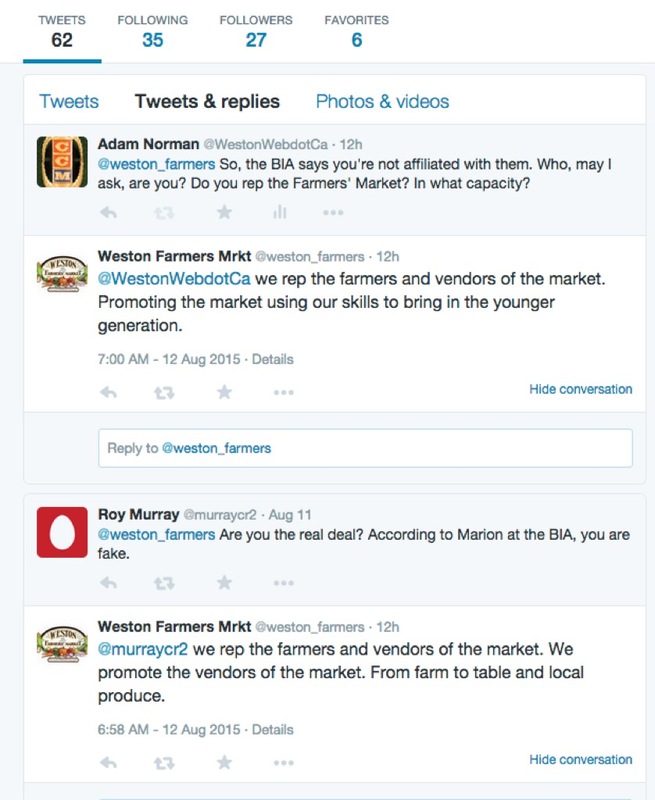 I trust the operators of these pages before a Weston B.I.A authorized (or not ) flunky.